Imagine this. China builds a military base on the Australian continental shelf off, say, Cairns. Then, according to the Australian prime minister, China threatens a military response should Australia attempt to exercise its maritime rights in accordance with a unanimous international tribunal decision that ruled this Chinese base unlawful. Next, that same prime minister suggests that Australia is “veering towards China”, and that Australian troops should be trained in China to “balance” the Australian Defence Force’s over-reliance on training in the US. The spokesperson for the prime minister also suggests that Australia should not protest against Chinese actions, but hopes China will hand over the base to Australia eventually. This is current Philippine reality. On 19 February, President Rodrigo Duterte, in a speech to a Filipino-Chinese business grouping, suggested that Philippine troops should be sent to China for counterterrorism training, as a way of balancing against the Armed Forces of the Philippines’ choice to train in the US. On 7 February, presidential spokesperson Harry Roque opined that in the future, the Philippines would thank China for constructing military bases in the Philippine-exclusive economic zone. Last year, on 19 May, Duterte stated that China’s Xi Jinping had told him China would go to war if the Philippines tried to drill for oil in the West Philippine Sea. 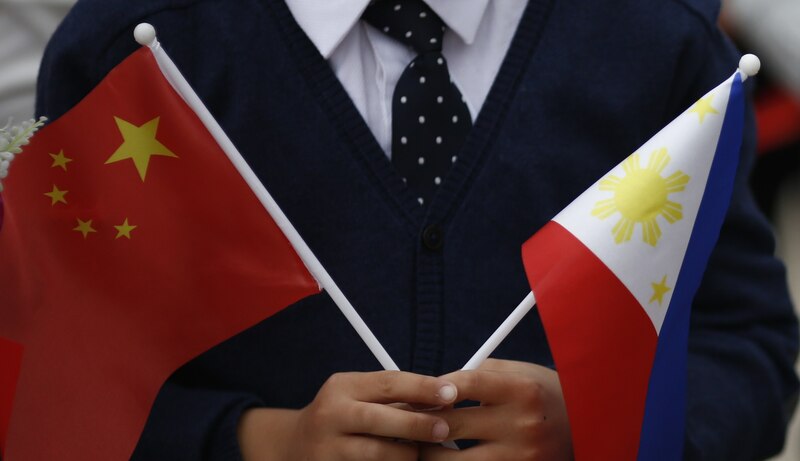 If this presidential idea to send Philippine troops to China for training is more than just an utterance to please the crowd (which included the beaming Chinese Ambassador to the Philippines), it will likely become another China-related source of potential friction between the Duterte and the military. That friction has already been on display. In late 2016, Duterte urged the Armed Forces of the Philippines to procure weapons from China and Russia; so far, however, no such ties have been made. In January 2017, Defense Secretary Delfin Lorenzana (who Duterte has joked is an American agent in his cabinet), issued a formal statement expressing the view that China’s military actions in the West Philippine Sea were “very troubling”. Last April, Duterte cancelled a planned visit to Pag-asa island in the West Philippine Sea at the request of China, which also lays claim to this maritime feature. Two weeks later, Lorenzana visited Pag-asa, promising to refurbish its ageing facilities. The more President Duterte pushes for closer military relations with China, the more it will put pressure on the Armed Forces of the Philippines and its leaders (who can be changed by the president) to respond positively. With more than four years remaining in Duterte’s current presidential term, his embrace of China and its implications for the Philippine military is an issue that Australia, and other countries who seek increased security cooperation with the Philippines, should watch closely.